What are you waiting for? The 2019 Toyota Sienna – the official van of family fun – is ready to go. 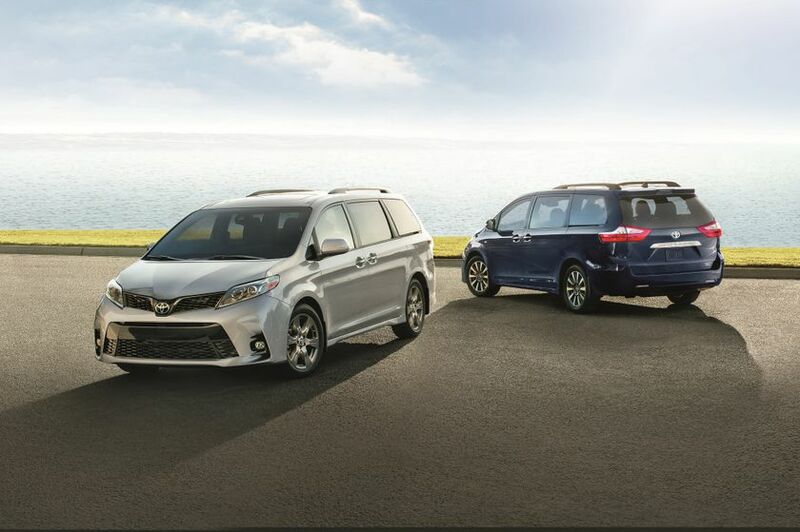 Sienna offers a choice of power-trains – including the only all-wheel drive minivan models in Canada – plus the advanced safety technologies of Toyota Safety Sense P as standard equipment, and a long list of convenience and comfort features that make every road trip a welcome adventure. New for 2019, the sporty and stylish SE grade is now also available with all-wheel drive. In addition, Apple CarPlay joins Entune as standard gear on all models, making the Sienna a rolling connectivity centre. New for this year, the 2019 Toyota Sienna SE AWD 7-Passenger combines sporty style and all-wheel-drive confidence, then adds a healthy dose of in-cabin technology. Performance upgrades include a sport-tuned front and rear suspension systems and sport-tuned electric power steering. These are matched with sport gauges, a unique grille, smoked headlamp surround and unique 18” alloy wheels. This model’s feature list includes an 8” Display Audio system, Entune 3.0 Plus, leather seating, eight-way power adjustable driver’s seat, four-way power adjustable front passenger’s seat, a leather-wrapped steering wheel, 4.2” multi-information display, chrome outer and inner door handles, illuminated front cup-holder, a 120v accessory power outlet, front windshield acoustic glass, power rear door with jam protection, fog lamps, LED rear tail lamps, and LED daytime running lights. The 2019 Toyota Sienna XLE AWD 7-Passenger combines the confidence of all-wheel-drive with impressive comfort and premium features. This model features an 8” Display Audio system with Entune 3.0 Premium, leather seating, eight-way power adjustable driver’s seat, four-way power adjustable front passenger’s seat, power flip-out side rear windows, wood grain trim, leather-wrapped steering wheel, the Smart Key System with power back door button and Push Button Start, a 120v accessory power outlet, the Blind Spot Monitor and Rear Cross Traffic Alert safety systems, rear parking assist sonar, anti-theft system, 18” 10-spoke alloy wheels, power moon roof, projector style halogen headlamps, fog lamps, and LED daytime running lights. This model may also be ordered with the available Limited Package for the ultimate in luxury and comfort. This package includes a JBL Synthesis Audio system, dual-screen rear seat BluRay entertainment system with two sets of wireless headphones, premium leather seating, eight-way power adjustable driver’s seat with memory system, leather-wrapped and heated steering wheel, the Birds Eye View Monitor system, front and rear parking assist sonar, 18” 10-spoke alloy wheels, exterior mirrors linked to seat memory with integrated signal lamps, puddle lamps and reverse auto-tilting function, dual power moon roof, rain-sensing wipers and high-intensity discharge headlamps with automatic high beam function.